A Stunning Couple | Faddegon's Nursery, Inc.
Blue Mist Shrub has shimmering blue flowers that look like annual Ageratum. The foliage can be silvery-green, yellow, variegated green & yellow or green & white. It grows 3’ tall and wide and is a butterfly magnet. 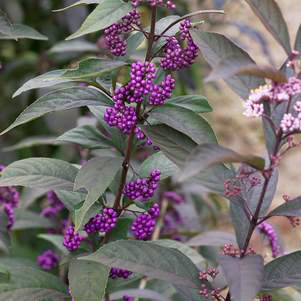 Beauty Berry’s smooth, round, lavender-purple berries are a nice contrast to Blue Mist Shrub’s fuzzy blooms. The berries persist into winter, providing a colorful display against snow. ‘Profusion’ and ‘Issia’ are two popular varieties. ‘Profusion’ is a bigger specimen reaching 8’ – 10’ while ‘Issai’ stays petite at only 2’ – 3’. 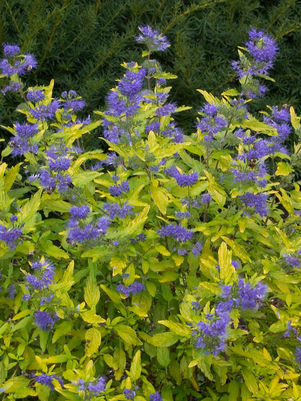 Blue Mist Shrub and Beauty Berry both enjoy full sun and are hardy to Zone 5. As with most late flowering shrubs, prune these in late winter or early spring.